Edenton Street United Methodist Church extends for a full city block in Raleigh, NC. After a recent renovation in several areas of our campus, we were excited to start planning new audio systems for two different areas; the 100-year old chapel and the Hub, our Youth Performance Center. The chapel, which sits at one end of our site, had been relying on an old ‘speaker on a pole’ system from the 60s or 70s to provide audio for the room. Obviously, this system needed to be upgraded, and we needed a solution that would provide clear audio for three speciﬁed zones; the octagonal-shaped space of the main room, the overﬂow room and the gathering area/lobby just outside the main room. I already deal with several different manufacturers in my day-to-day business (Dave Clemmer Productions), so was already very familiar with Martin Audio, and I knew that they would be able to provide the perfect solution for this room. We started looking at a new sound solution while in the planning stages for the renovation of the chapel. When we did the remodel, we added new doors, new walls and also built in a box design in the ceiling which would allow for the installation of the Martin Audio C4.8Ts we decided to place in this area. We have four C4.8Ts in the main chapel sanctuary, two in the overﬂow room and an additional four in the gathering area/lobby. We wanted a speaker system that would be heard and not seen, and because the C4.8Ts are recessed speakers, they easily ﬁt the criteria. Our chapel is typically used over the course of the week for smaller services and guest speakers. Many of our older congregants attend the Chapel events, so we needed to make sure that the audio was as crisp and clear as possible, as sound intelligibility has been an issue in the past due to the normal age-related hearing loss within the congregants. About 95% of the application for the audio in that room is spoken word with an occasional PowerPoint and/or video presentation. We didn’t have a reﬂection problem with the audio; the ﬂoor is carpeted, the chairs are all cloth – we just needed a good, clear, balanced area of audio reinforcement. With the Martin Audio C4.8Ts, I am able to control all three zones in the chapel area manually with a MIDAS Venice U16 mixer. We also installed two Lab Gruppen E-Series 8;2 ampliﬁers to distribute the sound to the different zones when and where I need it. The coverage is exceptional (one amp covers the ﬁrst two zones, and the second currently covers only one), allowing the effective use of lavalier and handheld wireless throughout the chapel without fear of feedback, and our congregants love the clarity of the system. In February, we will be adding a fourth zone in the breezeway that connects the sanctuary to the rest of the church, and will be installing four more of the C4.8Ts there as well. Across the street, we have an adjoining property that we acquired about 20 years ago which we’ve been using for our youth ministry. About a year and a half ago, we ran a capital fundraising campaign for the Bulla Youth Center, and were able to completely remodel the space. The E Street Hub is the main sanctuary in the youth center. It seats about 120 people, and is used for our youth message and worship, which run every Sunday night. The original room was 20’ deep by 50’ wide, but after our remodel (and knocking down some walls) it’s now 60’ x 60’, which is a lot more room. We completely modernized the look and feel of the Hub, adding ﬂ at panel screens, LED lights and, of course, an all-new audio system and the response from our young people has been incredible. The youth band is extremely talented, and having professional audio makes them sound even better. A Martin Audio MLA Mini center cluster consisting of four enclosures with an MSX sub behind them is ﬂ own from the open ceiling rafter space over the stage, which is 12’ x 18’, and about 1’ high. Even if our Youth minister or speakers are standing right in front of that center cluster 6’ above their head, there is zero feedback. The sub is time-aligned with the Mini cabinets via SMAART to provide consistent coverage from front to back and eliminate reﬂ ections off the back wall that create slapback echo that can hinder performers and speakers on stage. Coverage works very well for the music, left and right, front and back with a splay of about 70°. I worked with our design consultant, Cooper Cannady of RMB Audio, and was very pleased with their work. 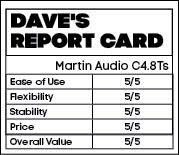 They’ve been working with Martin Audio brand since the start, and not only do they have great products and knowledge, but their customer service is exceptional as well. We’ve been extremely pleased with the Martin Audio systems installed for both our Chapel and The E-Street Hub, and would recommend them to any House of Worship looking for high-fidelity audio.